Welcome to Riverview High School�s Performing Arts. 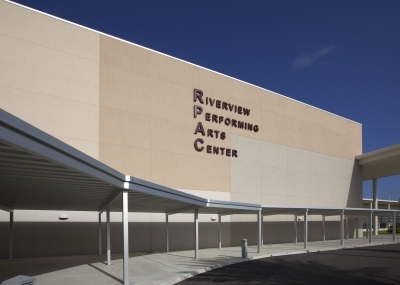 Welcome to the home of Riverview High School’s Performing Arts in Sarasota Florida! Riverview High School is proud and fortunate to have one of the best performing arts departments in the state. With a student population well over 2500 students, the performing arts programs educate and inspire over 500 students every year within multiple courses. Students at Riverview have the opportunity to participate in Choir, the Kiltie Marching Band, Orchestra, Jazz Ensemble, Percussion, Highland Dance, Drama, Bagpipes, Guitar Class and Ensemble. Non-performance classes also available at Riverview include Music Theory, AP Music Theory and Keyboard. Please click above to learn more about one of our many amazing performing arts programs. Welcome to our Performing Arts Center. For more information about the RPAC and how to hold your next event here, click on Performing Venue Info. To find out about our upcoming events at the Performing Arts Center please click Buy Tickets. Tickets available for purchase to our events can be purchased by clicking on the event. Our address is 1 Ram Way, Sarasota, Florida 34231.